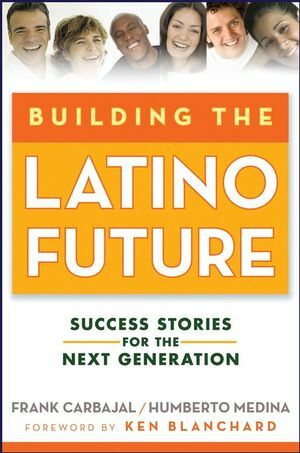 An inspiring collection of success stories from the country's most prominent Latinos, Building the Latino Future offers and inspiration and advice for Latinos in any industry who want to succeed spectacularly. The future is bright for America?s Latino community; this book lets you learn from the success of such luminaries as actor Edward James Olmos, New Mexico Governor Bill Richardson, former housing secretary Henry Cisneros, NPR correspondent Ray Suarez, and many more. Frank Carbajal lives in Santa Clara, California, where he is President of Es Tiempo, a coaching firm specializing in life and business coaching for small business owners and entrepreneurs in Silicon Valley. He holds an MA in human resources management and a bachelor's degree in social work.For more information, please visit www.estiempo.com. Humberto Medina is a speaker for The Ken Blanchard Companies® as well as a director and consultant for Latin American operations. He partners with businesses throughout South America, Europe, and the United States to improve the leadership and productivity of organizations in such varied industries as telecommunications, transportation, aerospace, government, manufacturing, utility, and mining. Foreword: Building the Latino Future (Ken Blanchard, coauthor of The One Minute Manager and The One Minute Entreprenuer). 1. Self-Discipline Is Key (Edward James Olmos, Actor, Director, and Community Activist). 4. Downhill at 85 Miles per Hour (Ruben Gonzalez, Three-Time Olympic Luge Athlete and Author). 25. People Are Always Watching You (Maria Contreras-Sweet, Chairwoman and CEO, Promerica Bank). 30. From Santee to Stanford (Margarita Quihuis, President and CEO, Hispanic–Net). 33. Surround Yourself with Successful People (Rudy Beserra, Vice President of Latin Affairs, Coca-Cola). 34. Living a Farmworker’s Dream (Martin Curiel, Vice President, Marketing, Denali Advisors, LLC). 36. Live Big and Reach for the Stars (Ysabel Duron, Co-Anchor, KRON TV, San Francisco; Founder and Executive Director, Latinas Contra Cancer). 48. Instilling Faith in Lower-Income Communities (Leo Chavez, President/Superintendent, Sierra College, Rocklin, California).